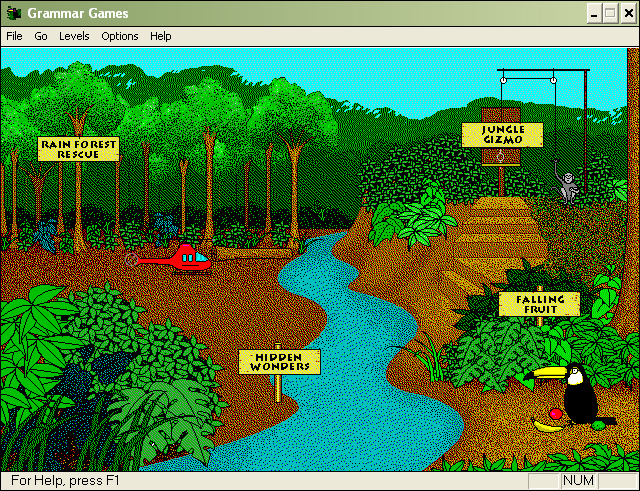 Rainforest Rescue: This has to be my favorite game when I was little. There’s so much happening at once: animals that need to be saved, bulldozers killing off trees, and fire raging all over. The purpose is to earn fuel for the helicopter by answering whether the given sentence is a fragment or a complete sentence. Level 1-3 are the same format, but it increases its difficulty each level. 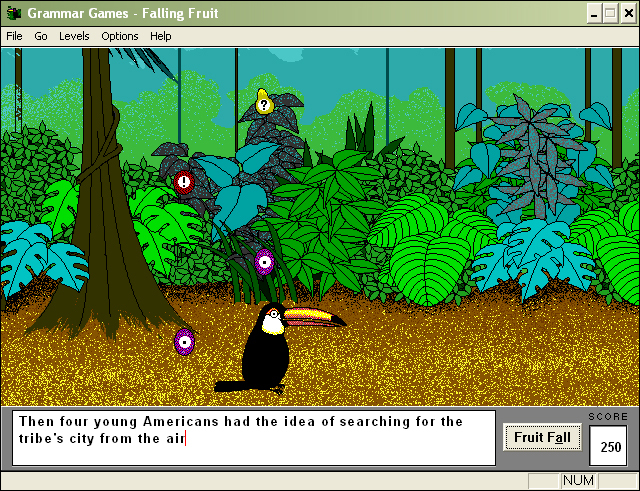 Falling Fruit: The purpose of this mini game is to determine what punctuation to use for the given sentences. You move a toucan around and place it underneath a falling fruit that shows a punctuation mark. This toucan will eat the fruit, but this toucan will attempt to eat any falling fruit including a coconut. If you place it under a fruit that shows the wrong punctuation or a coconut, it will cost you 10pts. Level 1 deals with ending punctuations while level 2 and 3 deal with punctuations in mid-sentences. Hidden Wonder: This is the least exciting out of all of the games. You identify verb tenses while reading a story dealing with some rainforest adventure. When you pass each “page,” a hidden object will appear like a flower or exotic animal. Level 1 has boxes over the verbs, level 2 still has the boxes but deals with irregular verbs, and level 3 has no boxes (you are forced to skim through a horrid story). 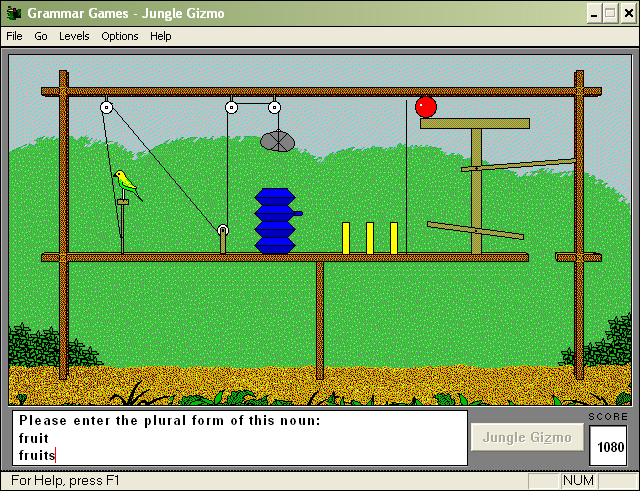 Jungle Gizmo: The mini game deals with possessive nouns versus plural nouns. An object appears for each correct answer. When the objects are all set in place, you can click “jungle gizmo” to watch a mini animation. The difficulty increase each level. Oh my gosh!!! I am a first year teacher and I always tell my kids about that game. It brings back so many memories seeing those screen shots! I was mildly traumatized because I never actually knew what a fragment was and my forest would burn down lol I would love to play it again! They should remake this game so kids today have a chance to play it. oh my god I’ve been trying to find what this game was called for years!!!!!!!!! 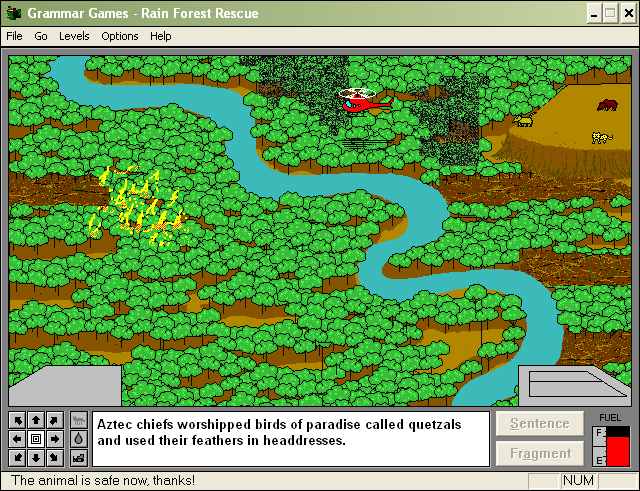 I googled so many different things “amazon jungle computer game” “amazon forest computer game” and it wasn’t until “rainforest computer game” that i finally found what i was looking for, this! thank you so much for this post, total lifesaver! Omg! I remember this game! The sounds, the toucan, the helicopter! Where can I play? OMG! I miss this game so much! I wish I could play it online. Thank you for bringing back this memory.